New and existing customers may now order a non-emergency fuel delivery online. Click on Request Delivery from the menu to the left and proceed through our easy check-out form. Another benefit of a full-service company is having the option to choose automatic delivery for your home heating needs. The biggest advantage of the automatic delivery option is that you do not have to monitor your fuel tank for the next needed delivery. Nowadays, families are constantly on the move and it is very easy to forget to check the level of your tank. With automatic delivery, customers don’t have to worry about running out and possibly enduring an off-route charge for a last minute delivery or, even worse, running out of fuel while away on vacation and having your house freeze up. We track your usage by our Degree Day Monitoring System. This system continually calculates the fuel usage rate for your home and then automatically generates a ticket for your next delivery. Selecting automatic delivery does not tie you into any fuel plans that we may offer, and pricing fluctuations in the market have no influence on our deliveries. It simply means you don’t want to run out of fuel. To sign up for automatic fuel delivery, please contact us. Of course we are happy to serve all will-call customers who wish to place phone or online orders for fuel deliveries as needed. Just make sure you have a good working tank gauge that you check often so you don’t risk running out. This is your best option for will-call, discounted oil prices. At Surner Discount Oil, we do all of our business online, offering solely oil delivery, and thereby passing the savings and discount from other services and personnel on to you. Go to surnerdiscountoil.com and click order oil to place an order online. 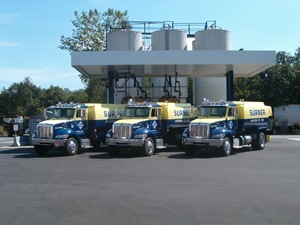 Since you would be a will-call customer, you would monitor your own fuel levels and, when needed, place an order with us online at surnerdiscountoil.com. You would benefit from discounted oil prices while still getting the same fuel as our full-service customers. This is the best price per gallon that Surner Discount Oil has to offer. You also get the added convenience of ordering oil any time day or night.